Pimples have been our life long companion in the journey called life ever since we crossed the threshold of puberty. No matter how much you loathe them or how many skin care products you try out, they seems to be intent on being a part of your life. But recently I stumbled upon the brand new product Garnier Pure Pimple Control Pen which claims to ensure a speedy recovery from your pimple prone skin. But are these claims true in reality? Read my review to know my experience and decide for yourself if you would like to try out this product for yourself! What does Garnier Pure Pimple Control Pen claim to do? The Garnier Pure Pimple Control Pen promises that it would dry out your pimples overnight so that your skin is able to heal quickly. It is enriched with ingredients such as eucalyptus and menthol which would soothe your skin and salicylic acid and Vitamin B3 which would stop your pimples from getting worse and spreading any further. Hence, we can vouch for the fact that this product can indeed assist you in combating your regular acne problem to an extent. Don’t expect it to work in case you have a serious acne problem which would need the attention of an experienced dermatologist. Does the product design seem to be attractive yet efficient? 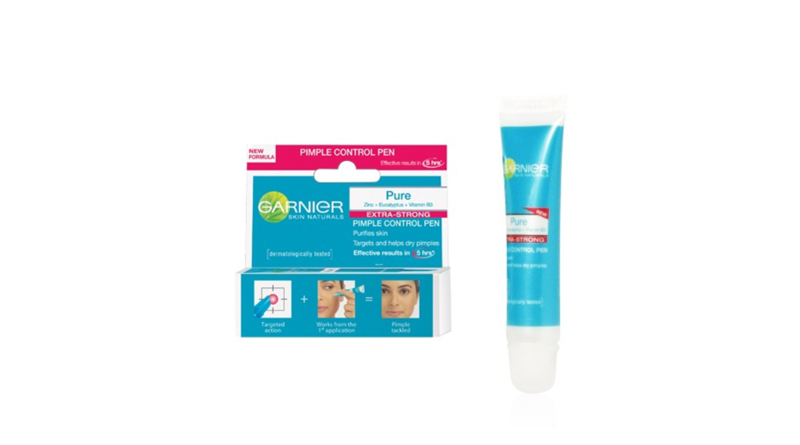 The Garnier Pure Pimple Control Pen is available in a small blue coloured tube of plastic with a small nozzle which aids in easy application. You can carry it in your purse wherever you go throughout the day so that you can use it whenever you feel convenient. Garnier Pure Pimple Control Pen is quite cheap when you take into consideration its effectiveness. You would have to pay only 95 rupees for a 10 ml tube. Start applying the Garnier Pure Pimple Control Pen on your pimples as soon as you spot a pimple appearing on your skin. Continue applying it two or three times in a day until and unless your acne vanished completely. It’s astringent like qualities would dry out the pimple and the salicylic acid would see to it that the impurities in your pores are completely cleaned. You don’t have to worry about the quality of the product as Garnier is reputed skin care brand which always uses natural ingredients which are suited to all skin types. The packaging is hygienic, travel friendly and easy to store. It quickly dries up your pimples without any pain or irritation. The small nozzle helps you apply the gel accurately on your pimples. Your pimples would get dried up within three or four days at most. The thick consistency of the transparent gel ensures that it covers up your entire pimple. The smell is not pleasant and might even induce tears if your pimple is too close to your eyes. Your pimples would dry up to form brown spots on your skin which would eventually end up in scarring. Since the tube isn’t transparent, you wouldn’t be able to know whether it has emptied. Don’t touch the nozzle as then the impurities from your hand would get transferred into the product. Don’t use your hands but rather use the nozzle when applying the product. Before applying it on your face, apply a little amount on your wrists to make sure you don’t have any allergic reaction to it. There you have our review of Garnier Pure Pimple Control Pen! We would advise you to weigh the pros and cons carefully before you invest your money in this product. After all, rubbing an ice cube would do everything this product claims to do without the side effects and the possibility of making you broke!